People who have followed my blog for a while know that I'm writing a book on peak oil investing. I'm still hard at work on that book and things are moving forward. I've got a developmental editor helping me focus it down to a publishable state. The peak oil debate has changed a lot in the last few years and I'm working to make the book relevant to the current debate environment. While I'm working to finish the peak oil book I want to tell you about another book I just published called "Anonymous Cryptocurrencies." Bitcoins and cryptocurrencies have been a passion of mine since early 2011, when I worked with Ithaca Hours on a plan to digitize their local currency. Since then I’ve seen the value of bitcoin rise from under $1 to over $1000. The advantages of bitcoin are becoming known to a wider audience and more people and companies are getting involved with the "future of money." One of the main disadvantages of bitcoins, however, is that they are not anonymous. In fact, using bitcoins is like posting your credit card statement on the internet but leaving your name off of the top. If anyone can link your name to your credit card number, they instantly know your full payment history. 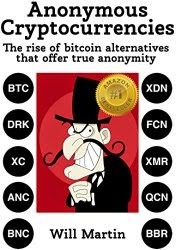 Luckily, a lot of smart programmers are developing alternatives to bitcoin that provide true anonymity. This year I decided to write a book on the subject. Because this space is so new, I'm actually the first person to write a book on anonymous cryptocurrencies. The basic premise of my book is that the global black market is enormous and growing and if even a small percentage of that trade takes place with these anonymous cryptocurrencies, their value could skyrocket. On a longer time frame I believe that these anonymous cryptocurrencies will help protect people from identity fraud, help people around the world fight government oppression and provide a safe and cheap way for the "unbanked" to conduct remittances. Peak oil is another candidate for global economic collapse. Oil is a finite resource and as such its extraction rate will eventually peak and decline - that is a geological fact. The consequences of peak oil could be dire because we are currently “addicted to oil.” Everything you see in the room around you (including yourself) is either directly made of oil, required oil in its manufacture and/or was transported to your room using oil. Every calorie of food you eat required 10 calories of hydrocarbons in the form of pesticides, fertilizers and diesel fuel to plow, plant, harvest, package, transport and cook it. When the global rate of oil production peaks and begins to decline, the economic and societal consequences could be tremendous if we haven’t developed oil-independent energy generation, food production and transportation infrastructures. No one knows when peak oil will happen or how dramatic the decline rate will be after the peak, but if it happens soon, we could see economies collapse. A peak-oil related advantage of cryptocurrencies is the fact that they are essentially “stores of energy.” Cryptocurrencies are usually generated through “mining” and mining requires electricity to power CPUs, GPUs and ASICs chips. The algorithms of these currencies adjusts the mining difficulty until it reaches an equilibrium. Using standard economic theory, over the long run this equilibrium should occur when the marginal cost of mining a coin reaches the marginal revenue of selling that coin. Since electricity is one of the main expenses associated with mining, over the long run the price of these currencies should fluctuate as the supply of mining rises and falls with changes in the price of energy. If peak oil (and peak gas and peak coal) will make the price of electricity rise over time, coins mined today with “cheap” energy should be a fantastic investment for a future with expensive energy. From a peak oil perspective, I believe that bitcoin and other cryptocurrencies hold a lot of potential. In the past when economies have collapsed (Soviet Union, Zimbabwe, Yugoslavia) the US Dollar has stepped in to replace the collapsed currency. With all of the global fiat currencies (including the dollar) being printed at unprecedented rates, in a future collapse we may see people turn to fixed-supply cryptocurrencies like bitcoin to fill the void. In a future with expensive energy, these "stores of energy" could also be a cheap method of intertemporal energy arbitrage. I hope you'll support my new book by purchasing a copy on amazon!